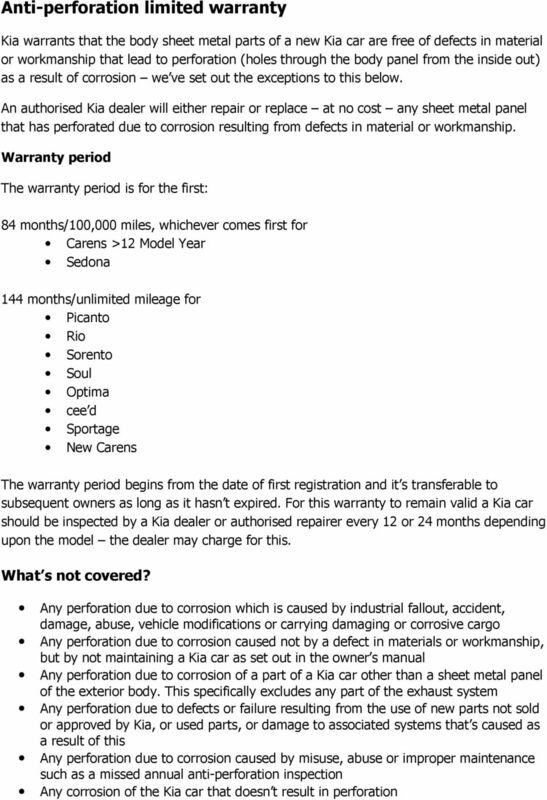 Download "Kia 7 Year Warranty. Terms and Exclusions"
3 Normal deterioration Normal wear, tear or deterioration such as discolouration, fading or deformation Surface corrosion on any part other than the sheet metal panels on the exterior body Gradual wearing of mechanical components in proportion to mileage The adjustment of doors, bonnets and tailgates is covered up to the first scheduled maintenance service. Normal maintenance Normal maintenance services described as scheduled maintenance services in the vehicles service book and maintenance in the owner s manual, such as: inspection cleaning and polishing minor adjustments lubrication oil/fluid changes replacement of filters anti-freeze coolant refill wheel alignment and tyre rotation unless these are done as part of a repair under this warranty. Altered mileage Any repair of a Kia car on which the odometer has been altered or on which the actual mileage can t be readily determined. Extra expenses and damages Kia won t reimburse for any financial loss or other damages. for example, loss of use, lodging and car rentals, travel costs or loss of earnings. 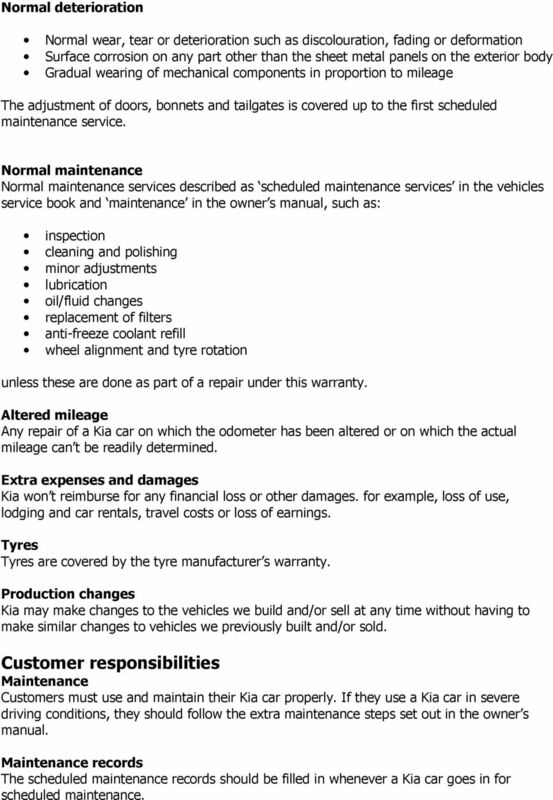 Tyres Tyres are covered by the tyre manufacturer s warranty. Production changes Kia may make changes to the vehicles we build and/or sell at any time without having to make similar changes to vehicles we previously built and/or sold. Customer responsibilities Maintenance Customers must use and maintain their Kia car properly. If they use a Kia car in severe driving conditions, they should follow the extra maintenance steps set out in the owner s manual. Maintenance records The scheduled maintenance records should be filled in whenever a Kia car goes in for scheduled maintenance. 5 Customer responsibilities Customers should regularly look closely at the sheet metal panels on the exterior body regularly. If any stone chips or scratches in the paint or protective coating are found, they should be touched up straight away. In certain conditions, special care should be taken to protect your Kia from corrosion. If driven on salted roads, or near the sea, flush the underbody with clean water at least once a month It s important to keep the drain holes in the lower edges of the body clear If damaged in any way that may affect the paint, have it repaired as soon as possible If carrying special cargo such as chemicals, fertilisers, de-icing salt or other corrosive substances, make sure that they re well packaged and sealed If often driven on gravel roads, we recommend the installing mud flaps behind each wheel After each regular check, make sure the correct anti-perforation record in the manual have been stamped by the Kia dealer or authorised repairer Limited liability Under this warranty, Kia are only liable for the repair or replacement of original parts by an authorised Kia dealer that are defective in material or workmanship. Kia are not liable for any costs you may incur getting to a dealer, supplying a replacement car or as a result of being without the car during warranty repairs. 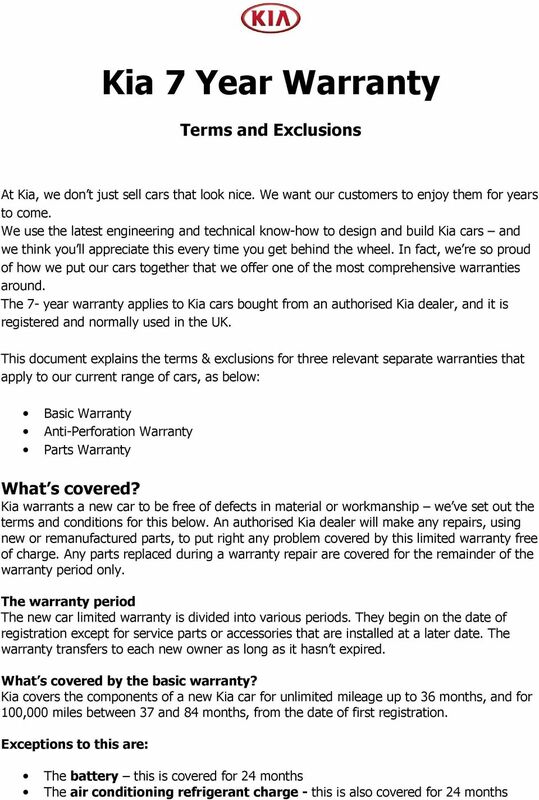 Parts limited warranty Kia warrant that Kia Genuine Parts will be free of defects in material or manufacturing we ve set out exclusions to this below. 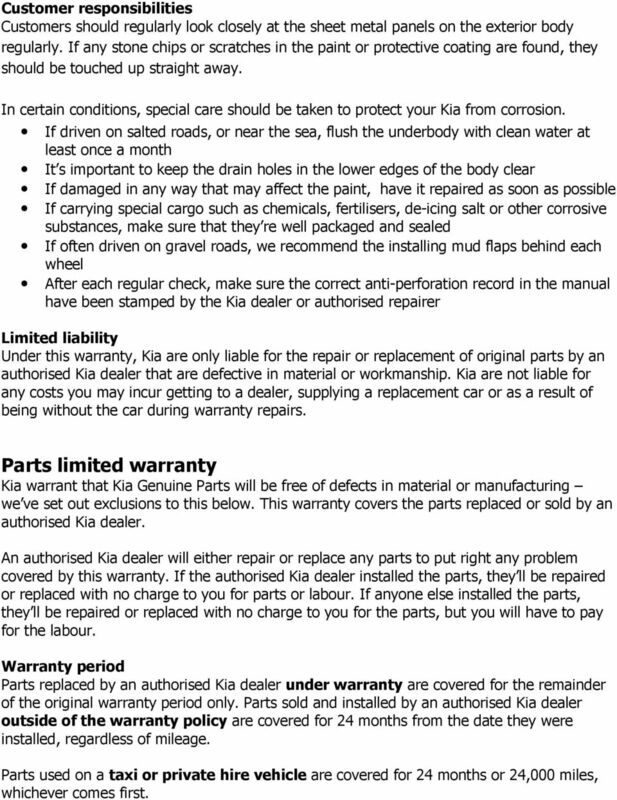 This warranty covers the parts replaced or sold by an authorised Kia dealer. An authorised Kia dealer will either repair or replace any parts to put right any problem covered by this warranty. If the authorised Kia dealer installed the parts, they ll be repaired or replaced with no charge to you for parts or labour. If anyone else installed the parts, they ll be repaired or replaced with no charge to you for the parts, but you will have to pay for the labour. Warranty period Parts replaced by an authorised Kia dealer under warranty are covered for the remainder of the original warranty period only. 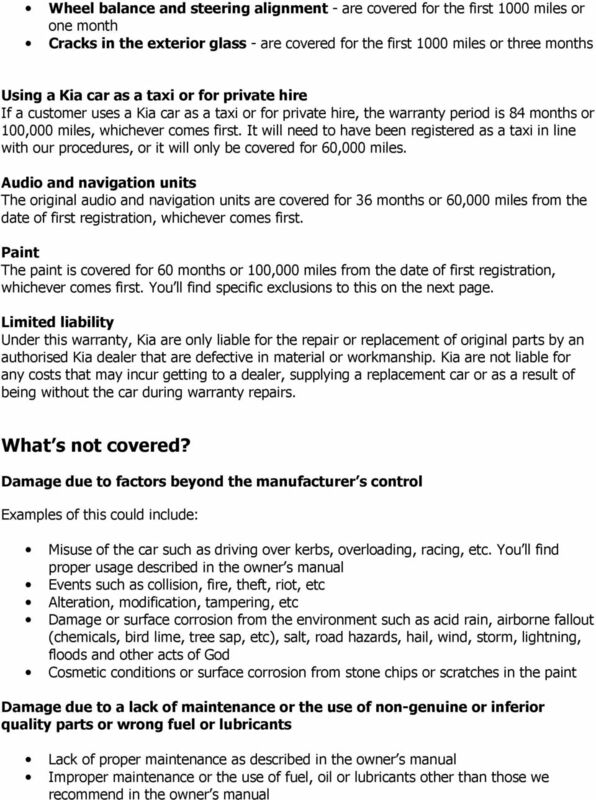 Parts sold and installed by an authorised Kia dealer outside of the warranty policy are covered for 24 months from the date they were installed, regardless of mileage. Parts used on a taxi or private hire vehicle are covered for 24 months or 24,000 miles, whichever comes first. CARING FOR YOUR BMW. QUICK REFERENCE GUIDE. Your Vehicle Return Made Easy. Your Mercedes Benz finance journey. A guide to your next steps. Fair Wear and Tear Guidelines Hyundai Fair Wear and Tear Guidelines This document should be read in conjunction with your finance contract, and the Guaranteed Future Value Details, with Hyundai Finance.